Every good piece of art begins with a vision: a statement or feeling takes root in an artist's head and becomes an idea that demands to be expressed. Some visions are more easily achieved than others—art can sometimes be just as much an industrial experience as a creative experience. But no matter how far-reaching your dreams, almost any artistic vision can be realized when you have the right tools for the job! Obviously, artists are no strangers to working with tools. Paint brushes, potter's wheels, and straight edges are everyday art supplies used by artists to transform ideas into real-world presentations. There are many tools commonly used by artists and crafters, however, that are so versatile that they aren't necessarily identified as strictly art supplies. Some can be difficult to find in art shops or hardware stores. Luckily, MisterArt.com has all sorts of tools in stock ready to ship anywhere in the country! Palette knives are great for mixing and blending colors of paint on a palette and for applying color to a canvas. They're also ideal for removing clay from pour holes after casting a mold. Precision and pen knives are extremely sharp, making them excellent for delicate, precision cutting, trimming, and stripping of art materials like paper, plastic, balsa, thin metal, cloth, film, and acetate. Utility knives typically feature retractable blades designed for cutting and scoring tough, heavy-duty art materials without going dull. Sets and kits are available that come with a variety of knives and blades to give artists options as they complete their projects. MisterArt.com also has great deals and fast shipping on a number of knife accessories and replacement blades! Light boxes and projectors are two tools that utilize electric light for very different purposes. Light boxes use several light bulbs beneath a pane of frosted glass to create a work surface used to view translucent films, such as slides. Originally used to sort photographic plates with ease, many artists now use light boxes as an aid in inking and tracing. Projectors use mirrors and illumination to throw images on to a wall or canvas for easy viewing and tracing. Often these tools are used to enlarge images. MisterArt.com ships light boxes and projectors all over the U.S.! We've also got amazing deals on accessories like bulbs, lenses, and stands. Magnifiers use convex lenses to create a magnified, virtual image of an object or picture on the other side of the lens from the viewer's eye. Magnifiers serve many uses in art. Fine details on very small projects can be painted or carved more precisely using a magnifier, and small images can be blown up to much larger sizes using convex lenses for the purposes of tracing or display before a large audience. Because they serve such a multitude of purposes, magnifiers come in many different shapes and sizes. Many include lights to increase visibility further. No matter what kind of magnifier your project requires, you'll find the deepest discounts online at MisterArt.com! Paper trimmers are tools designed to resize and reshape paper for art projects, often many sheets at once. Paper trimmers typically use measurements to easily and accurately cut paper very swiftly, so that a large volume of paper can be altered in a short amount of time. Paper trimmers are also very useful for cutting tougher, more resilient paper, such as cardboard, which is more difficult to trim using scissors or utility knives. Possibly the most common paper trimmers utilize adjustable paper guides that hold paper steady for a swinging, bladed arm. 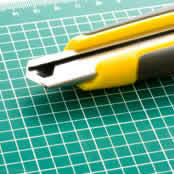 There are many paper trimmers designed to cut specific shapes, such as circles or greeting cards. Paper trimmers come in many different sizes in order to accommodate many different kinds of paper. You can find the best deals on all sorts of paper trimmers at MisterArt.com! Punches are great craft tools used to poke holes in art materials such as paper, leather, and even metal. Some punches are designed to create holes for fasteners such as brads or rings; other punches create a decorative hole, such as a heart shape. Because of the many uses and materials that punches are utilized with, a wide variety of punches have been developed to best accomplish these tasks. Some punches are designed only to be used on the corner or along the edge of a sheet of paper or other craft supply. For artists who want to poke holes closer to the middle of their artwork, adjustable punches are available that can be placed anywhere you need on your paper project. No matter what kind of punch your art project requires, you'll find discounted prices every day at MisterArt.com! An essential tool for crafters! Scissors are the perfect way to cut, shape, and customize any paper project safely and easily. Scissors are great art tools because they're safe enough for kids to use, but sturdy enough to cut even rugged art materials time and time again without sharpening. Because scissors have overlapping blades, they are not symmetrical. This asymmetry is true regardless of the orientation and the shape of the handles: the blade that is on top always forms the same diagonal regardless of orientation. Most scissors are designed to be used in the right hand; left handed scissors have handles which are comfortable to hold in the left hand. MisterArt.com offers everyday discounts on both right- and left-handed scissors. Different pairs of scissors have been designed to best cut differing craft materials from aluminum to tissue paper. Some scissors are designed to make jagged or wavy cuts, in order to create decorative paper borders for scrapbooks and other projects. MisterArt.com has fast shipping all over the U.S. on these and many other scissor designs! Keep your art supplies organized! Staplers and fasteners are time-tested methods of attaching papers, fabrics, and other art and craft supplies attached to one another, ensuring that nothing gets misplaced or out of sequence. Not only have paper staplers long been mandatory desktop tools in offices for generations, tough, heavy-duty staple guns have been developed for more rugged uses such as upholstery and framing! While staples are designed for semi-permanent binding, they also damage art materials slightly by punching holes. There are also many temporary fasteners available which can attach papers and fabrics while remaining removable. Folding binder clips and bulldog clips come in many sizes and are strong enough to clamp even larger, heavier art supplies together without damaging them. These fasteners work in much the same way as a classic hinged clothespin. For fastening art and craft supplies that aren't quite so flat as paper and fabric, rubber bands have proven up to the job for decades. Just remember not to accidentally snap yourself! You can find the Internet's best deals on all manner of staplers and fasteners online at MisterArt.com! Spray booths are handy art tools designed for the studio or work area where sprayed materials are used frequently. Essentially, spray booths create small cubicle dividers that prevent paints, adhesives, and other sprayed materials and fumes from contamination surrounding areas. The ideal booth accommodates flat or 3-D objects. It's perfect for crafters, model builders, hobbyists, and commercial artists! Many spray booths feature a three-stage filter system: a replaceable pre-filter sheet, which captures the bulk of the sprayed materials, a thick polyester mid-filter, and a polyester/carbon filter. It also features a built-in exhaust adapter for venting out-of-doors or to another space. These features are designed to keep artists and their workspaces clean and free of toxic fumes and materials. The booths come in a variety of sizes to accommodate the projects of artists ranging from model builders to commercial airbrush artists. No matter how large or how small your project, you can find the supplies you need at great prices at MisterArt.com! Thank you once again for your fast and courteous service. You are now at the top of my list of art suppliers to order from. Perfect for cutting plastic. cardboard, and more!